The Americans With Disabilities Act (ADA) is grounded in the human rights perspective. Like other civil rights legislation, the ADA is aimed at an oppressed group, persons with disabilities, who have been denied equal opportunities to participate in the larger society. As Pardeck makes clear, the goal of ADA, ending discrimination against people with disabilities in all facets of American life, is aligned with the philosophies and traditions of the social work profession. 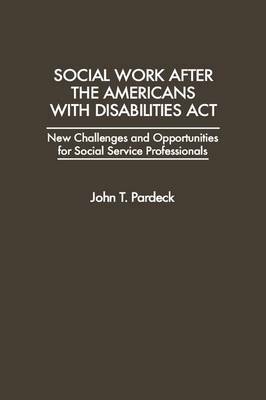 Pardeck provides a detailed overview and analysis of the ADA that will help professional social workers as well as students entering the field realize the full significance of the new rights and protections extended to people with disabilities. He also provides specific case studies and examples to illustrate the range of opportunities afforded the disabled and their advocates.